There are lots of advantages to living alone. You don't have to fight over the TV, you always know where things have been put, and if you run out of milk, you've only got yourself to blame. However, living alone doesn't come without its security risks. Unfortunately, you could be considered as an easier target for burglars. This shouldn't stop you from living the independent life – all you need to do is take a few safety precautions to keep yourself safe. We have helpfully put together some security tips that should help you remain safe when living alone! We're not saying that you have to invite them around for tea but we do think it's worth taking the time to meet your neighbours. All you need to do is go and introduce yourself or even just say hello when you see them out and about. You never know when you might need them in an emergency! Get to know their routines so that you can spot someone suspicious hanging around your house. Houses with pets are less likely to be broken into – thieves must think they are more likely to alert someone if they are caught by a barking dog. Pets have a natural instinct that can detect crime and alert you to danger. Not only will they deter crime, they also provide you with a housemate that won't argue with you about what to watch on TV! Pets are loveable companions – brilliant for those living alone. Could something as simple as closing your curtains actually stop your house from being broken into? Statistics seem to think so. Studies indicate that opportunist burglars will look into windows before deciding if a house has something worth stealing. By closing your curtains, you're not allowing them the chance to look in! Apart from making sure that you lock your doors, something you should do whether in or out, it's important that you have a good security system in place. Most burglars are scared about getting caught, which means they will avoid houses that look well secured. A residential burglar alarm is definitely something you should install – this will alert you to anyone trying to get into your home. Does your house have motion sensors? This will also let you know if someone uninvited is lurking around. 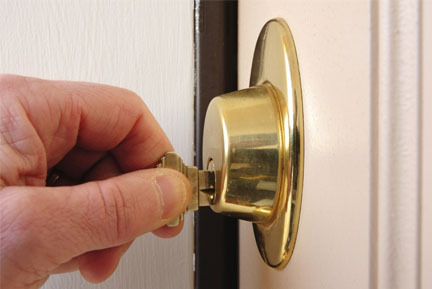 If you need to update the security in your home, please don’t hesitate to contact us. BWS Security are a leading provider of security services and systems, providing security products such as burglar alarms, fire alarms and CCTV in Bristol. If you would like to speak to us about security, you can give us a call on 01225 800 602 and a member of our professional and friendly team will be happy to help.